MetaStock 10 is now released! In this newest version of MetaStock we’ve packed in more power, more flexibility, more features . . . more of what YOU need to make your best, most profitable trades. Check out the new features in MetaStock by clicking here. MetaStock Pro is specifically designed for real-time traders—traders who use intra-day data to transact in real-time throughout the trading day. Whether you're an experienced, active trader or just learning how to trade the markets, MetaStock helps you succeed. The software contains powerful analysis tools to help you make informed decisions about what to buy & sell and when to execute to make the most money possible. 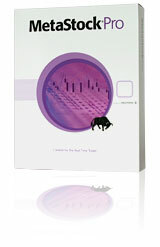 MetaStock comes with many out-of-the box trading solutions that are reliable and easy to use. And if you want to take your analysis to the next level, MetaStock gives you the ability to customize these solutions to your particular trading style. "MetaStock is obviously made by people who understand traders' needs. It's a complete package that's easy to use, no matter what kind of securities you trade. It's the single tool that's allowed me to fine-tune my trading approach, pursue my avocation and build a satisfying retirement." We recommend pairing MetaStock Pro with our QuoteCenter real-time data feed for the highest quality data at the best price. MetaStock Pro version 10 is available with the QuoteCenter data feed only. eSignal is available with version 9.1.